When I started this project back in early 2015 as an intern student, I did not realize the impact and importance of this study in the field of plant hormone biology and gene family evolution in general. This study has not only answered the questions that we started with but also opened up even more new research avenues than we thought. Original article published in eLife can be found here. This project was kicked-off by getting access to the OneKP data, which is a massive resource of over 1300 plant transcriptomes that cover all major clades in the plant kingdom. At that time, this data was only available for limited release. But my supervisor, Dr. Dolf Weijers, immediately got me the access to the data by collaborating with the people leading the project (co-authors on our paper). 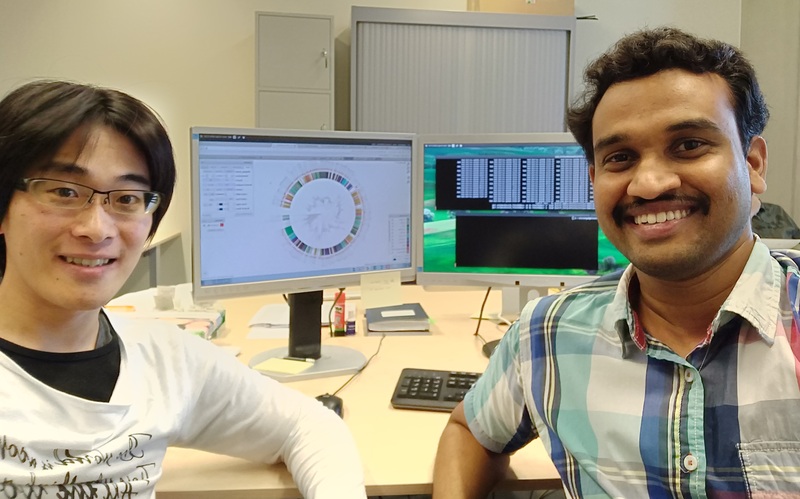 I started my journey as an intern student during my Masters’ degree in Bioinformatics here in the Laboratory of Biochemistry at Wageningen University. It was difficult at the start to get the project going because of the lack of experience in dealing with large datasets. The only goal was to somehow figure out the origin and evolutionary patterns of key gene families in the Nuclear Auxin Pathway (NAP). I was in panic for a few weeks, as I did not know where to get started, neither with the bioinformatics nor with the biology part. But the support and input from Dolf gave me enormous energy and ideas, after which I took small steps in building a pipeline to do this massive data mining and analysis task. First we started looking into the Auxin Response Factors (ARFs), the key DNA-binding transcription factors in the NAP. This gave us completely unexpected results, we found the roots of certain domains of ARFs even in red algae, which have originated more than a billion years ago. The most interesting part was to see how these independent domains later came together to form a full and likely functional ARF that we see in land plants. Then I finished my internship successfully with an understanding of the origin and evolution of ARFs as the main outcome. During my internship, I developed a strong interest in the evolution of gene families, and I decided to expand this analysis further with other gene families of the NAP, as a part of my PhD. I started working on the transcriptional co-repressors (Aux/IAAs) and the auxin receptors (TIR1/AFBs). Extracting the ARF and TIR1/AFB homologs and their phylogenetic analysis was quite manageable, because the proteins were long enough (500-700 amino acids) and there was enough phylogenetic signal to derive good trees. But the real challenge was in analysing the Aux/IAA phylogeny. Because there were hardly 50 conserved amino acids, and with a poor phylogenetic signal. So, I tried various programs and parameters both with protein and nucleotide sequences of varying lengths to get to a tree that has good bootstrap support. This gave me the good lesson that having more sequences is not sufficient for building meaningful phylogenies, but a good phylogenetic signal with a balance between number/length of sequences is more important. At the end, we were able to get both solid and informative phylogenetic trees that gave us some clarity about the evolution of these three gene families, but they also inspired many new questions. A flowering plant amidst the flat mosses, that have an evolutionary distance of hundreds of millions of years. Photo credit: Hirotaka Kato. To test some of these questions, we got Hiro (Dr. Hirotaka Kato) on board. He came in with his experience in bryophytes, especially the liverwort Marchantia polymorpha. But he immediately adapted his knowledge to grow/culture other bryophytes, fern and green algae as well, to perform RNA-seq experiments to experimentally determine the genome-wide capacity of auxin regulation across 6 plant species. He took on the struggle of growing the vastly different species, with different growth conditions and varied nutrient requirements. We did an initial run of RNA-seq, which did not work effectively in all species used in the study, likely because of varied auxin treatments. Later, Hiro designed a way to provide homogeneous auxin treatments by transferring the plants to liquid medium prior to auxin treatment to reduce the stress effects leading to differential gene expression. Finally, he also generated mutants in M. polymorpha, to further understand the loss of certain crucial genetic elements of the pathway. Ultimately, we were able to put together my bioinformatics part with Hiro’s biochemistry and genetics to develop the paper. We realized how the drawbacks/limitations of one field of study can be compensated with other fields to answer some interesting questions in plant evolution. This study has answered some key questions related to the evolution of gene families not only in NAP but also opened up new direction of thoughts in plant evolution in general.